Hypokramed uses Microsoft SharePoint 2010 as the main information system. The main implemented processes are related to sales and service – the key company activities. Management wanted to monitor these activities using graphical reports and statistics. Data warehouse, which is SQL server database, that contains cleansed and consistent data related to sales, invoicing, service and operations processes. It includes a history of former systems. 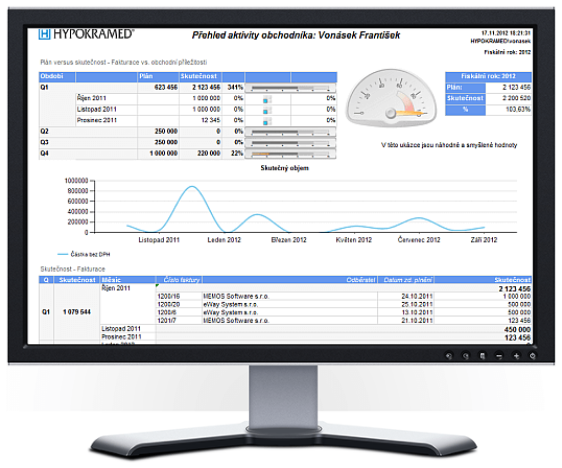 Reports displaying Salesmen performance overview, sales statistics, Service activities overview etc. Data pumps. Data were loaded directly from SharePoint content database, including all relations. The warehouse is synchronized every half an hour, so users get their data almost real-time. Another part of the data is taken from the accounting system. Reports are nested directly to SharePoint sites, so users have got everything they need in one place. The part of the implementation was a suggestion of system settings to optimize the server performance. Some forms in SharePoint were changed or simplified in order to improve the user experience.